Enjoy no annual fee and flexible rewards. Earn 10,000 bonus FlexPoints worth $150 on airfare, hotel stays, car rentals and more. You’ll appreciate having a no annual fee card. For the first 9 billing cycles on any balances transferred within 60 days from account opening. After that, a variable APR, currently 16.24% to 26.24%3 based on your creditworthiness. 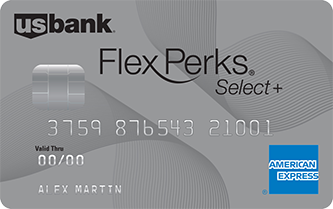 While using the U.S. Bank FlexPerks® Select+ American Express® Card for every purchase, Anna found the FlexPoints added up fast. Anna redeemed FlexPoints to take that long overdue vacation. For example, 25,000 FlexPoints can be redeemed for $375 in airfare, hotel stays, car rentals and more. You can enjoy travel offers, shopping deals, entertainment access and more — making it easier for you to take advantage of your Cardmember benefits. Visit amexconnect.com/usbank to learn more.